Meghan Markle has sent royal fans into a flurry of excitement and they are convinced she is pregnant – but do you agree with their reasoning? Meghan Markle and Prince Harry tied the knot in May and ever since people have been speculating that the couple were going to start a family as soon as possible. On their wedding day the couple both proved they’ve got a way with children and in their engagement interview they were upfront about their desire to have kids ‘in the near future’. Plus, people close to the couple remarked that they would want to have children ‘as quickly as possible’. However, with Harry and Meghan’s first royal tour together taking place in Australia, Fiji, Tonga and New Zealand this autumn, many have speculated that the couple will have to wait longer to start a family. It’s been reported that Harry and Meghan would have to delay trying to conceive until the New Year as a safety measure against the Zika virus, which is very harmful for pregnant women. Meghan is wearing a navy blue Givenchy dress and coat and a hat by Noel Stewart. She finished off the outfit with matching shoes and a clutch bag from Noel Stewart too. But royal fans were quick to point out that the outfit also seems very handy to hide a little baby bump. A third added: ‘Judging by the fact that she’s wearing a heavy coat indoors; Meghan Markle is either pregnant or the type to get chilly easily. #royalwedding #royalwedding2’. On arrival at the wedding Prince Harry and Meghan dashed straight into St George’s Chapel, most likely to ensure they don’t detract too much attention away form the bride and groom. What do you think? 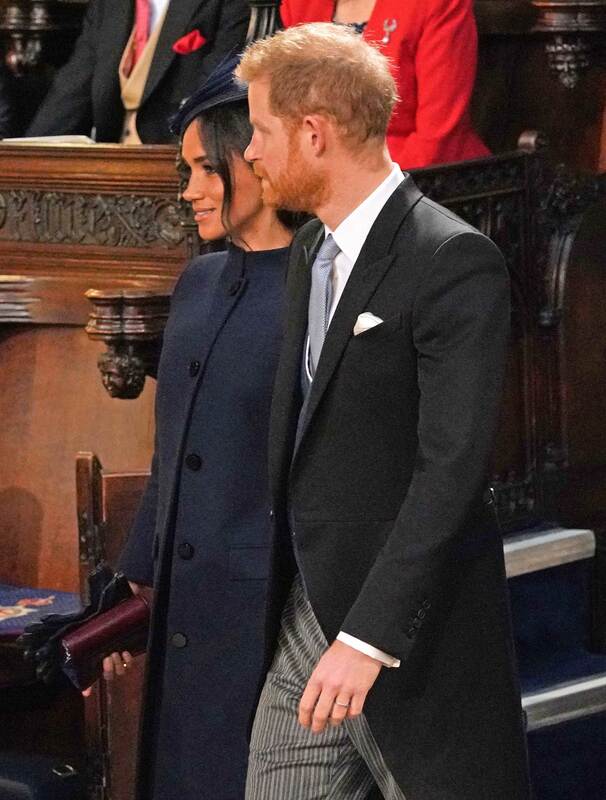 Is Meghan hiding a little baby bump under her Givenchy coat or was she just dressing for the British autumn? Head over to our Facebook page to share you thoughts!